The Lib Tech Darker Series use to be the Dark Series but then it went darker and added C3 BTX to the ride. The change to this quasi-hybrid camber really brings back some old camber memories and really changes the ride from the C2 Power BTX Dark Series. It’s much more aggressive and like the old Dark Series it’s still not for everyone but the technical aggressive rider will have a blast on this board. 2015 and 2014 Lib Tech Darker Series Review- Pretty much the only thing that changed from 2014 to 2015 is the paint. Conditions: Hard to medium Sierra snow and one day with practically perfect sierra snow in the morning that got a little messy midday. 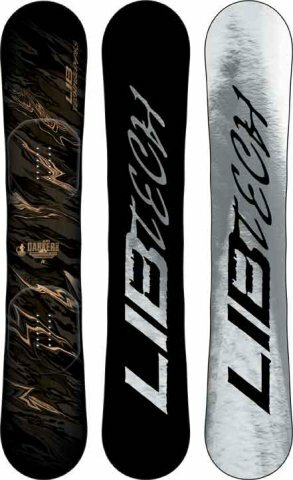 On Snow Feel: One of Lib Techs remaining boards with a lot of aggressive all-mountain going in the ride. It’s stable and semi-catchy ride that many camber riders will absolutely love. It’s not as catchy as true camber but it sure a lot more of a challenging ride compared to the old C2 hybrid rocker shape. It’s for that mostly directional rider that loves to carve, loves the pipe and loves speed. Powder: There is a step down in powder performance compared to the older model with C2. You have a .5″ set back and if you are a camber rider it will be fine but if you are someone coming from the hybrid rocker to full rocker side you will find this a lot more work. Turn Initiation and Carving: The C3 mostly camber hybrid camber combined with risers, a pretty narrow waist, and somewhat deeper sidecut makes this a quick board edge to edge if you know what you are doing when it comes to making turns. It’s a really fun board to turn and especially to carve. You can carve uphill and with the extra edge hold carve in conditions that even aren’t ideal. Speed: A good base and a damp stable ride make for a fast board. It’s not a freeride bomber but it’s a very competent all mountain bomber. Especially when it’s new. As it softens up it’s a little less damp but you can get through most long flat cat tracks if the board is well waxed. All in all a good board for bigger mountains. Uneven Terrain: It’s better than we thought it would be. Edge Hold: Same excellent solid grip that can be a little grabby in softer snow. This is a great board for those that see harder conditions more than softer. Flex: The Darker Series feels med/stiff but if it’s like the older Dark Series it will mellow out to a more medium flex once you get a good amount of days on it. This isn’t really a butter board and you can’t really get too much out of this flex for slowing down and playing around the mountain. Switch: This feels more directional than a directional twin. It rides switch well but doesn’t feel like most Mervin boards. It’s much more fun leading nose first. Jibbing: Not ideal for the jib park with this flex. Pipe: Really fun pipe board for those that know what they are doing. It’s great for those that like to drive from wall to wall and really carve up the pipe wall until it’s launch time. I’m not that type of rider so I felt I had to back off from making that massive launch happen. It’s that kind of fun board for those that like. Jumps: There is a good amount of spring out of this board if you want to ollie off a big natural feature on the mountain. It’s also a decent board for lapping the jump park but it’s not perfect for those that take off switch or land switch a lot like some of the other poppy twins in Mervin’s line. All in all, this is the same board that is not for everyone but some will truly love. Especially those directional carve loving riders. We try to get as many images of the Lib Tech Darker Series, but forgive us if they're not all there.